March 15th was a busy day for 3CSN! Among other activities, we held Spring Regional Sharing Summits in the FIER/OC as well as Los Angeles regions. Our West LA event was a roaring success with a modest but strong contingent of students, faculty, staff and administrators from West LA College as well as a smattering of those from other campuses in the region in attendance. 3CSN coordinators Crystal Kiekel, Gia Gambaro Blount, and Kelan Koning were thrilled to join this wonderful group in a day of interactive professional learning. We kicked off our time together with a creative brain stretching exercise that led to a fascinating discussion on how differing perspectives and organizational skills relate to “making sense of things,” which in turn led to a discussion of metamajors and approaches to initiatives such as Guided Pathways and AB705. Once we were warmed up (and, thanks to Gia and her early childhood education background, “cleaned up”! ), participants engaged with text sets and case studies and then created team inventories and action plans. The small size of the group allowed for deep conversations and engagement. Our three inquiry areas: Engaging student participation and perspective, designing for inclusive collaboration, and learning about learning, had a student-centered lens. Students felt comfortable fully engaging in the discussion as well as asking tough questions about next steps. 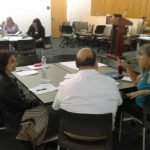 They shared their thoughts about power dynamics in the classroom that left faculty participants with new insights into how to nurture students’ sense of agency in their education as well as the importance of deeply listening to their thoughts and needs. Students expressed that they felt included and appreciated and how that helped them feel more confident to engage with challenging material. 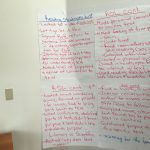 Participants shared out final action plans and set a Monday morning goal. 3CSN coordinators will be following up with them to see how it’s going.